URIAH HEEP - LIVE IN ARMENIA (2CD+DVD DIGI) | Online Shop | Wizard LTD. 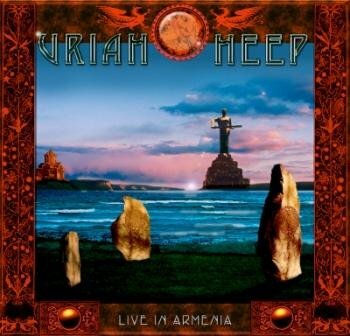 Album: "LIVE IN ARMENIA (2CD+DVD DIGI)"
URIAH HEEP releases " Live in Armenia " 2CD+DVD. In October 2009, Uriah Heep released their 40th Anniversary 'Celebration' album, containing new studio recordings of 12 of their most successful, classic tracks, plus two brand new songs. This recording heralded an exciting new phase for the band, taking their classic sound right into the future. The band hit the road to celebrate 40 years at the top and opened new frontiers in Eastern Europe, Australia, South Africa, Japan and America. The band has played 53 different countries in total. The band's motto has always been "if the people cannot come to see and hear Heep music, we will take it to them" and based on that when the band was invited to play for the first time in Armenia, they did not think twice and went for it. So when the band agreed they were approached by TV and film crews to document this concert which shows an epic performance and an incredibly strong and powerful audience reaction. Uriah Heep, who indisputably invented Hard Rock in conjunction with Black Sabbath, Deep Purple and Led Zeppelin, have sold in excess of 30 million albums since their inception in 1969. From their early incarnation as The Gods and Spice, through record breaking tours, gold and platinum selling albums, timeless chart scaling anthems and a fiercely dedicated fan base of worldwide proportions, Uriah Heep can rightly claim to be one of the greatest U.K. Progressive Heavy Rock bands of both the 20th and 21st centuries.